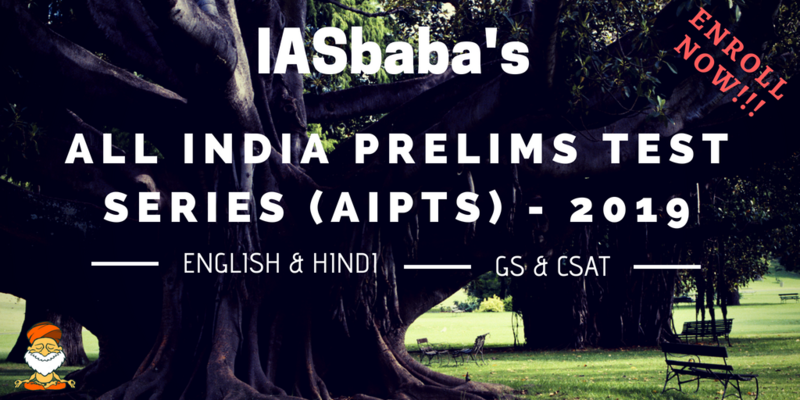 We are proud to announce the commencement of the ALL INDIA PRELIMS TEST SERIES (AIPTS)-2019. Our decision to come out with AIPTS stems from the fact that not everyone requires the same pedagogy. Many of our followers are already through with the syllabus and simply want to check their preparedness on a regular basis. So, there it is - AIPTS, an initiative, tailor-made for those who want to streamline their preparation and monitor their progress at regular intervals. Just like ILP, AIPTS is driven by quality. AIPTS gives you the chance to cover the syllabus of UPSC in a planned and systematic way and at the same time a platform to compete with thousands of sincere candidates. The best thing about AIPTS this year is that we have synced the AIPTS with the schedule of ILP (Hence ILP-2019 users should not join AIPTS-2019). This way you get to compete with our ILP followers as well. You will get to know other details of AIPTS in the document given below. Once you join the AIPTS, make this document your friend, philosopher and guide throughout your journey. We wish you luck and success. All India Prelims Test Series-2019 is available in ENGLISH and HINDI. There will be a detailed solution for each test. PDFs of questions and solutions will be sent to registered email ID. It can also be downloaded after taking the tests online. To be part of All India Ranking, one has to appear for the exam as per mentioned Rank Publish Date (preferably before the next test date). For each test, there will be THREE attempts. Ranks will be calculated based on the very first attempt. There is no fixed time to take the test. It's flexible. Tests will be uploaded on the respective dates as mentioned in the plan. The validity of the tests is from July 2018 to June 2019. You have to take tests/download PDFs between the given period only. In no case, there will be any assistance from our side after the expiry of the programme. You can join AIPTS 2019 anytime. There is no deadline. ILP 2019 users need not join AIPTS 2019. Test Platform will be activated 1 days before the first test. NOTE: After the successful payment, please check your email (SPAM and JUNK FOLDERS TOO). You will receive an acknowledgement for the fee paid. Also, you can Download the PDF after successful payment, it contains your ID and Password. Do not try to log in before 20th July. We will notify once the platform is activated. Offline Payment Details: Please mail us the acknowledgement at ilp@iasbaba.com if making offline payment.